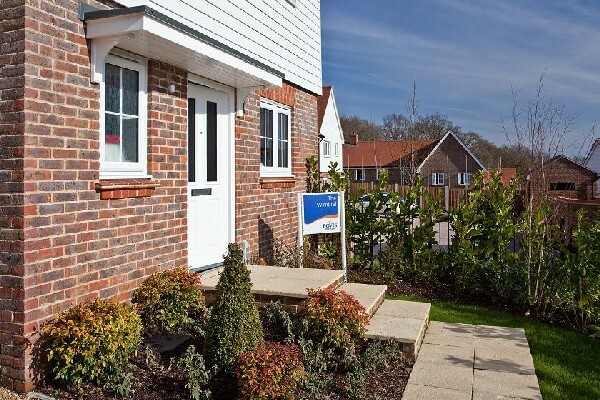 Everything is coming up roses at Bolnore Village in Haywards Heath thanks to Bovis Homes - although there are some dahlias, geraniums and chrysanthemums thrown in for good measure! We have teamed up with fellow housebuilder Crest Nicholson to help local residents make the village look even greener in preparation for the 'Britain in Bloom' competition this summer. Organised by the Royal Horticultural Society, the national competition is one of Europe's largest horticultural campaigns and enables local communities to show off their efforts in environmental responsibility, community participation and horticultural achievements. Bolnore has been shortlisted as one of 80 national finalists from 2,000 entries, after winning gold at last year's South and South East in Bloom - the regional competition to qualify for the national contest. Local residents got stuck into sowing a variety of colourful plants and flowers, donated by Bovis Homes and Crest Nicholson, in the upper, middle and lower parts of the village, which will soon add to the beauty of the already leafy district. With the judging panel arriving in July, the locals were keen to get cracking early to ensure that Bolnore was a winning entry. "Britain in Bloom is an iconic competition, and if they were judging it on the determination and dedication of the local community then they should hand over the award to Bolnore now!" said Mary McHutchison, Area Sales Manager for Bovis Homes South East region. "We're proud to be a part of the campaign and to be working so closely with the community and Crest Nicholson. This is a fantastic part of the world and when July comes around Bolnore really will be blooming and should hopefully really impress the judges." For more information on Bolnore Village, contact the sales office on 07767 618497. It is open daily 10am to 5pm. You can find out the latest prices and availability here.